Two of the major land grants in the Inland Empire, Rancho La Sierra Sepulveda and Rancho Sobrante de San Jacinto, were granted by Governor Pio Pico just before the end of Mexican rule in California. Rancho La Sierra, which included the present day La Sierra area, ended up the property of Abel Stearns. Rancho Sobrante, which included the area around Lake Mathews, portions of Corona, and the western portion of Riverside to approximately Harrison Street was sold to a San Francisco mining syndicate which, in addition to mining tin deposits, subdivided the valley portions of the land and sold one of the subdivisions to William T. Sayward and S.C. Evans who named it the New England Colony. The tin miners and the New England Colony owners joined together to engineer and dig a canal in order to supply the land with water. The engineer they hired was Captain Christopher Columbus “C. C.” Miller, newly arrived from Tomah, Wisconsin in 1874. 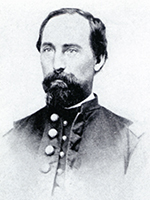 Miller had served building railroads for the Union Army during the Civil War, working under Grenville Dodge, later famous for his work on the Union Pacific. The canal work led to the first major clash between S. C. Evans and Riverside founder John North’s Southern California Colony Association. Evans and his partners started the canal in 1874, based on estimates of $35,000 to construct the canal. These estimates relied on obtaining a right-of-way through North’s settlement and the Southern California Colony Association, obviously a major competitor with Evans, refused. North’s financial partner, Charles Felton, unhappy that his investment in North’s venture seemed to languish without a return, traded his controlling interest in the Southern California Colony Association for stock in Evans’s better-financed venture. The new partners formally organized the Riverside Land and Irrigating Company. When the map of the new Riverside Land and Irrigating Company Tract was filed in 1876, the map was signed by the firm of Miller & Newman, an engineering firm Miller had formed with his Swedish engineer son-in-law, G. O. Newman. Miller and his wife, Mary Clark Miller, had met in Ohio, as students of Oberlin College. They had four children. Emma, the oldest, married G. O. Newman in 1876. Frank, who became the master of the Mission Inn, was 17 when the family arrived in Riverside. On January 23, 1877, the Southern California Colony Association, now under Evans, sold Miller and Newman Block 6, Range 6, of the Town of Riverside for $250. The block was bounded by Main Street, Sixth Street, Orange Street, and Seventh Street. The home they built, called Glenwood Cottage, grew to take in paying guests. In 1878, Miller and Newman built a large addition and the building became the Glenwood Hotel. The wood frame addition was two stories high and was attached to the family adobe, providing a row of bedchambers. On August 29, 1879, Miller bought Newman’s share for $3,280. Newman was appointed Deputy United States Surveyor with the Geological Survey of the States of Nevada and California in April 1880. On February 4, 1880, C. C. Miller and his wife, Mary, sold the Glenwood property to their son, Frank, for $5,000. Shortly after, Miller moved to Blythe to take over the Blythe Canal project after the murder of the project engineer, Oliver Calloway. Later, in 1885, Miller became the engineer on Riverside’s largest water project, the Gage Canal. C. C. Miller is listed as the adjutant of the Riverside Post 188 of the Grand Army of the Republic in 1886, the year the post was founded.